I picked this photograph because it is one of the only four-generation photos I have of my "San Diego" Carringer/Smith/Auble family. Event: Perhaps Christmas 1919, New Year's Day 1920, or a special day. Setting: In front of my great-grandparents home at 2105 30th Street in San Diego, California (on the northeast corner of 30th Street and Hawthorn Street). I grew up in this house after it was moved to the middle of the block in the 1920s. * Georgianna (Kemp) Auble (1868-1952) - seated on the left, my great-grandmother, mother of Emily Kemp (Auble) Carringer. * Mary Ann "Matie" (Smith) (Chenery) Cramer (1866-1922) - standing on the left, daughter of Abigail "Abbie" (Vaux) Smith, sister of Della (Smith) Carringer. * Lyle Lawrence Carringer (1891-1976) - standing on right with a bow tie, son of Austin and Della (Smith) Carringer, husband of Emily (Auble) Carringer, and father of Betty Virginia Carringer. * Abigail A. 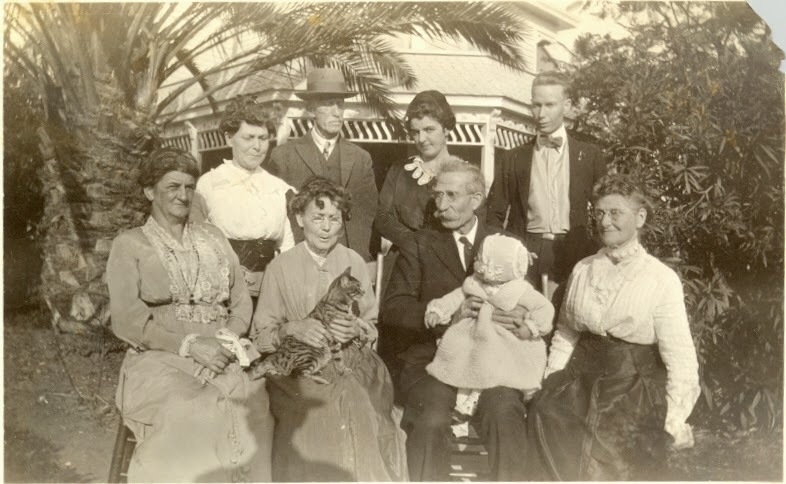 (Vaux) Smith (1844-1931) - seated on right, mother of Della (Smith) Carringer. I forgot the cat - he was Buster (????-????). Randy, Love your family photo. Here is the one I decided to highlight.